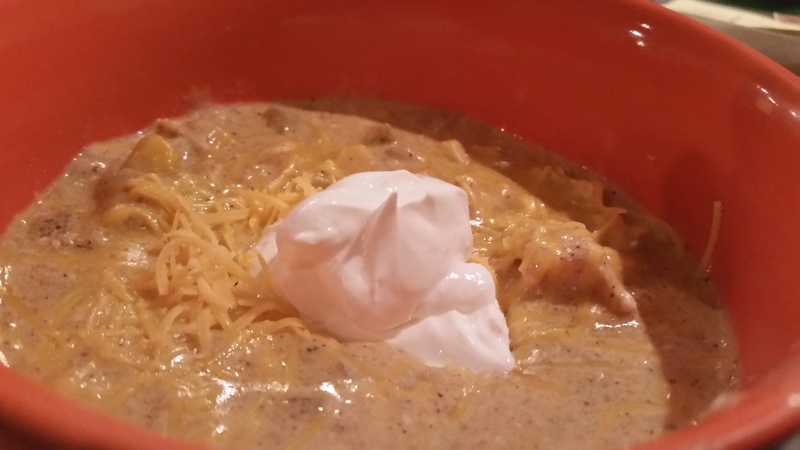 Slow Cooker Creamy Turkey Chili – What's for Dinner Moms? Happy New Year to all! Hope this year brings you all the dreams you are wishing! Determination. That is my touchstone word for 2018. Starting out right by using all that I have. Cleaning out the freezer this month is a good place to start. Use up all those bits and pieces that you have stored from the holidays. I have a couple of loaves of bread to make into bread crumbs and some delicious pieces of leftover meats to make into stews and casseroles. This recipe is a good start for using up some of the leftover turkey. When my daughter had her friends over the other night I needed something for dinner that I could use some of those turkey leftovers in and that satisfied one picky eater and one adventurer eater. This recipe can be customized to your heat level by adding hot chilies instead of mild, a dash of Cayenne pepper, and or some hot sauce. This was perfect for my non-heat seeking eaters. I served it with extra hot sauce on the side for those that wanted a bit of a kick. With the sour cream and a sprinkle of cheese on the top this was not really spicy at all but still had a good flavor. I serve this with cornbread on the side and a green salad. Place chicken breasts (if raw), beans, corn, chiles, chili powder, cumin, stock, garlic and onion powder in the bowl of the slow cooker. Stir, cover and cook on low for 6-8 hours. One hour before serving melt butter in a saucepan over medium heat. Sprinkle melted butter with flour and whisk to combine. Allow mixture to thicken and turn slightly golden brown about 2-3 minutes. Pour 1/2 and 1/2 into the saucepan slowly as you continue to whisk mixture. Cook until the mixture is thickened. Add salt and pepper to taste. Pour butter mixture and sour cream into the slow cooker and stir well. Cook on low for 1 more hour. If using whole chicken breasts at this point cut or shred the meat for the chili. Stir chili and taste. Adjust spices as necessary. Serve hot with sour cream and green onions for garnishes as desired. Thank you! Hope your roast was delicious! My new year is starting with a freezer full of leftovers. This includes turkey, and ham. I hope you keep going with your great creations, and have a great new year with a well-fed – and very happy family. Thank you so much! Hope you have a peaceful New Year! Happy New Year Marci to you and yours. I am fixing your Crustless Egg Pie for our brunch. And there is banana nut bread in our future too. Yummm! Have a great day and a wonderful New Year! I love turkey and chicken. So, this is a great recipe!! Thank you, Marci! Why the cream cheese? Why the flour and the insane amount of butter? You hammer in the calories and it makes the dish so unhealthy. Sorry, I have to ask.